· New Thinner finer blades glide effortlessly through hair with less tug and pull. · 5 Blade ProGlide System shaving surface technology... has 5 blades spaced closer together to help reduce pressue - with extraordinary comfort. · 1 Precision Trimmer Blade... built into the back of the cartridge. Perfect for tricky places like sideburns, under the nose, and around facial hair. 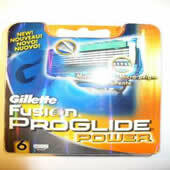 · Fusion Power cartridges can be used with all Fusion Razors. Gillette Fusion ProGlide Power cartridges provide incredible comfort even if you shave every day. The new thinner, finer blades glide effortlessly through hair with less tug and pull. Reformulated lubrication strip, with more lubricants and a touch of mineral oil. Redesigned precision trimmer, with improved blade and anti clogging rinse slots. Includes a micro comb that helps guide stubble to the blades for an even better shave. Contents. PEG-115M, PEG-7M, PEG100, Paraffinum Liquidum, Tocopheryl Acetate, Aloe Barbadensis, BHT.